Nidia Ibarra of Stanfield is surrounded by Irrigon defenders including Breena Tolar, Kim Campos, Staci Stanger and Christina Garcilazo. IRRIGON - The Stanfield Lady Tigers defeated the Irrigon Lady Knight 45-31 on Tuesday, February 10, 2009. It was a close game until the fourth period when the Tigers outscored the Knights 19 to 7. It was senior night for the Knights and seniors were acknowledged prior to the game. Breena Tolar, Kim Campos, and Christina Garcilazo were celebrated with balloons and flowers. The Knights exchanged leads with the Tigers throughout the first period. Kim Campos of Irrigon hit a three pointer with about three minutes to go. Other Knights scoring included Noelle Wright who hit two freethrows and Tolar scored on a layup. Tigers scoring included Mikayla Baros and Tara Nichols. The Tigers took the 14-12 lead at 5:28 in the second period on a three pointer. The Knights came from behind to lead by one on shots by Campos and Tolar. Stanfield swung right back hitting shots by Jade Martinez and Jessenia Carrillo. Stanfield led at halftime 22 to 17. The third period was low scoring with Irrigon outscoring Stanfield 7 to 4. Irrigon's Tolar hit two, Wright hit one and Garcilazo hit a freethrow. Carrillo and Nidia Ibarra were the only scorers for the Tigers. Stanfield led at the end of three 26 to 24. Stanfield came alive in the fourth period scoring 19 points to Irrigon's 7. The Tigers went to the freethrow line many times during the period. Scorers for Stanfield included Baros, Carrillo, Erica Gehrke, Carly Valadez, and Nathalie Cook. Knights scorers included Alison Burnett, Wright, and Kendra Kimble. Stanfield pulled away at the end to win 45 to 31. 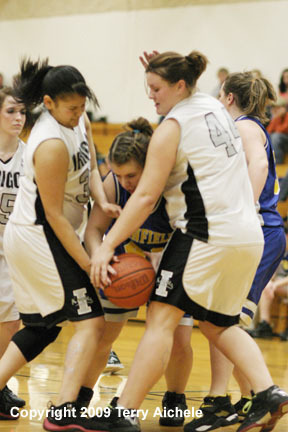 LEFT - Irrigon's Kim Campos, left, and Noelle Wright go for control of the ball. RIGHT - Mikayla Baros of Stanfield is closely guarded by Noelle Wright of Irrigon. LEFT - Senior Christina Garcilazo of Irrigon hangs onto the ball while being pressured by a Tiger's defender. RIGHT - Nathalie Cook of Stanfield eyes the basket while Noelle Wright towers over her. 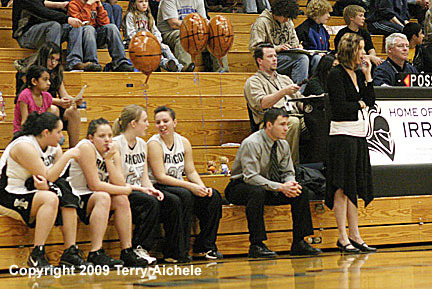 LEFT - Irrigon head coach Candice Valentine watches the action. 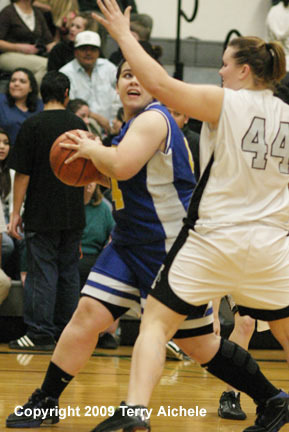 RIGHT - Christina Garcilazo of Irrigon drives to the basket for a layup.